Rhythmic Gymnastics dates way back into the 1800's. But it wasn't until 1984 that rhythmic gymnastics became and individual competitive event in the Olympics. The 1996 Olympics was the first to include group competition. World championships have been held annually, in succession of host cities since 1963. 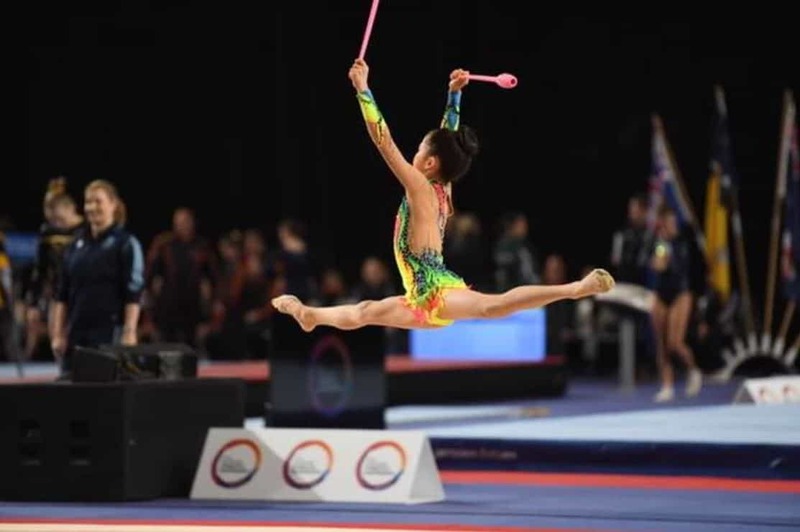 It is a modern type of gymnastics with the performance of systematic physical exercise with the aid of such hand apparatus as ropes, hoops, balls, clubs and ribbons. The elements includes jumps, leaps, pivots, balances and flexibility movements. Element routines are performed utilizing various pieces. Rhythmic Gymnastics is a combination of gymnastic techniques and fluid dance like movements, choreography, balance and agility with the hand apparatus. Coordination and control are the two main essentials as the gymnasts performs in harmony to the selected music. It is a beautiful sport that combines the grace of a dancer and a coordination of an athlete. Skills developed through rhythmic gymnastics such as hand eye coordination and body awareness, transfer well to the other sports. To do well in rhythmic gymnastics, students must learn to move their arms and hands in coordination with other body parts. This learning process involves the entire body and the mind. Gymnasts can compete individually or in teams of five. A panel of judges rewards gymnasts for their performance where gymnasts display their skill such as leaps, jumps, balances, pivots, acrobatics and apparatus handling.